Look what I got in the mail today, tucked in with a check! 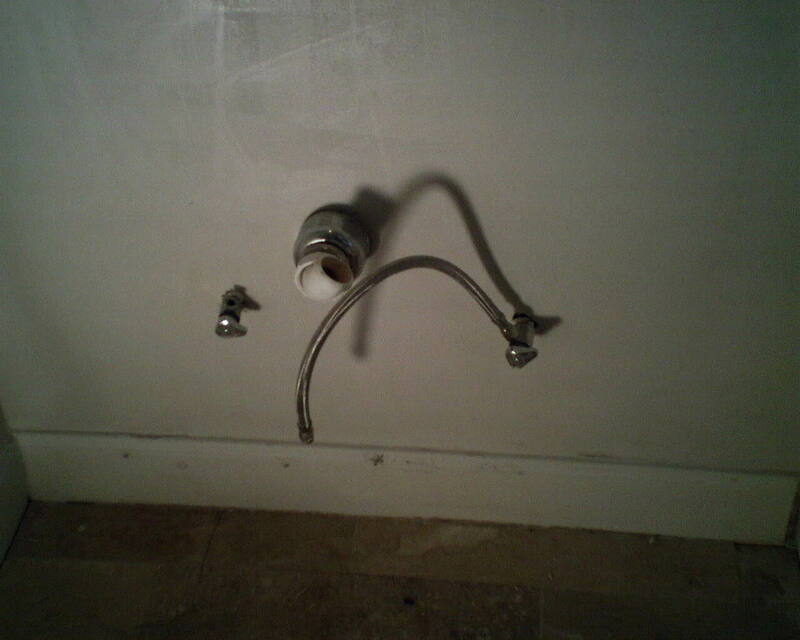 The poor homeowner, who was rehabbing a whole house, had a LOT of problems and disappointments with other contractors – delays, poor workmanship, over budget, etc. 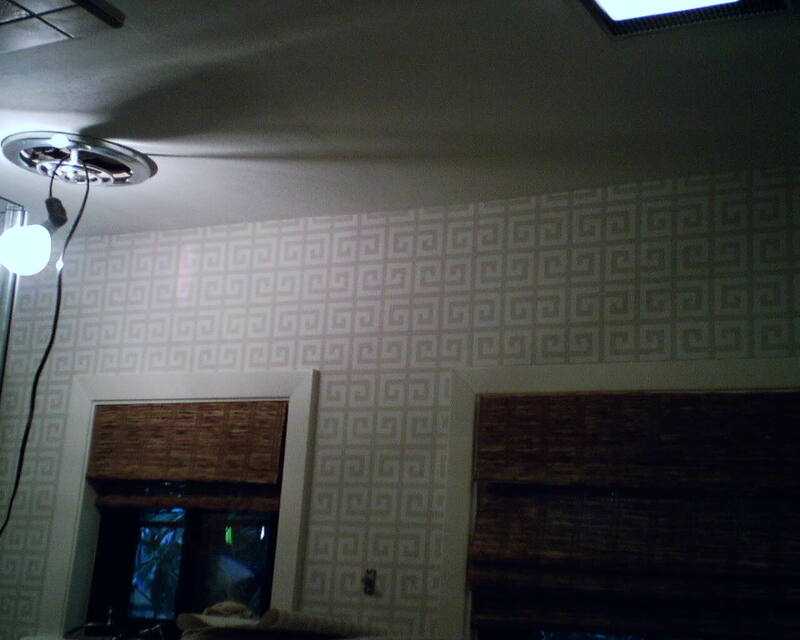 For me, this was a particularly difficult wallpaper install – but I got ‘er done! In the top photo, you are looking at the back of a strip of wallpaper that has been pasted and booked (folded pasted-side-to-pasted-side). 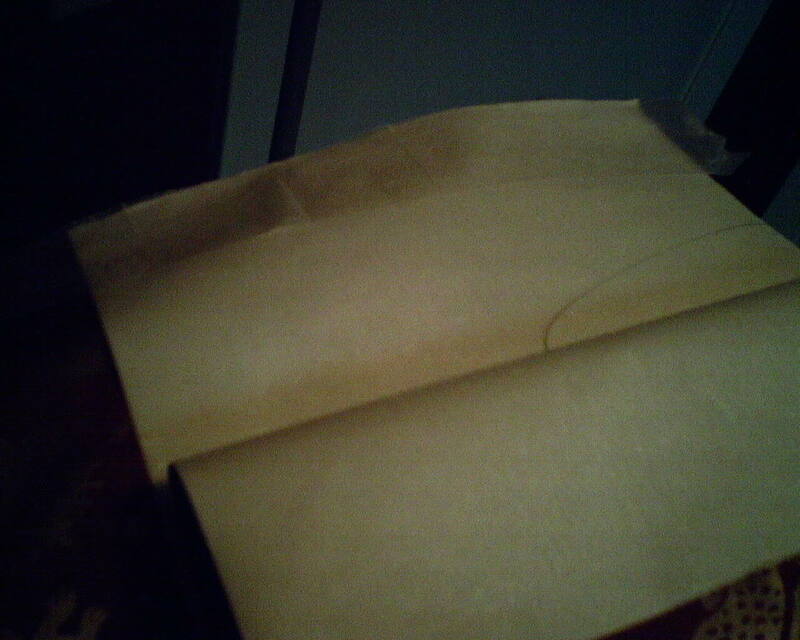 I have unbooked a few inches to show the 2″ wide strip of waxed paper along the top. The top inch or so of wallpaper will be cut off a the ceiling line, and this strip of waxed paper will keep paste off the ceiling. In the second photo, at the wall, I have placed the new strip on the left against the strip on the right, aligning the pattern. I have trimmed the excess from the top of the strip, but have not yet removed it. 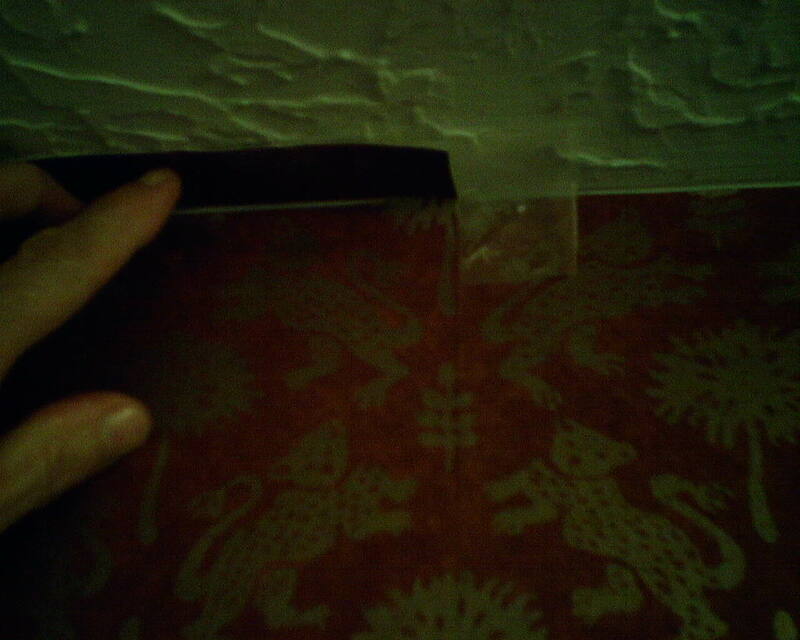 You can see the waxed paper sticking out to the right of the strip of wallpaper, both on the wall and on the ceiling. See how it’s keeping paste from getting on the ceiling? It’s also keeping my paper from sticking to the wall! 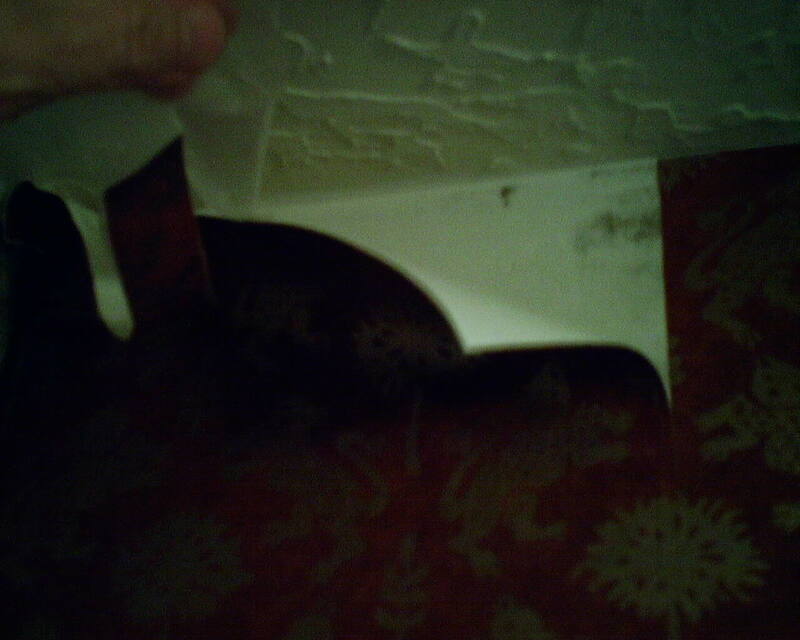 In the third photo, I am removing the piece of wallpaper I trimmed off at the ceiling line, and am also removing the remaining bit of waxed paper behind the wallpaper on the wall. 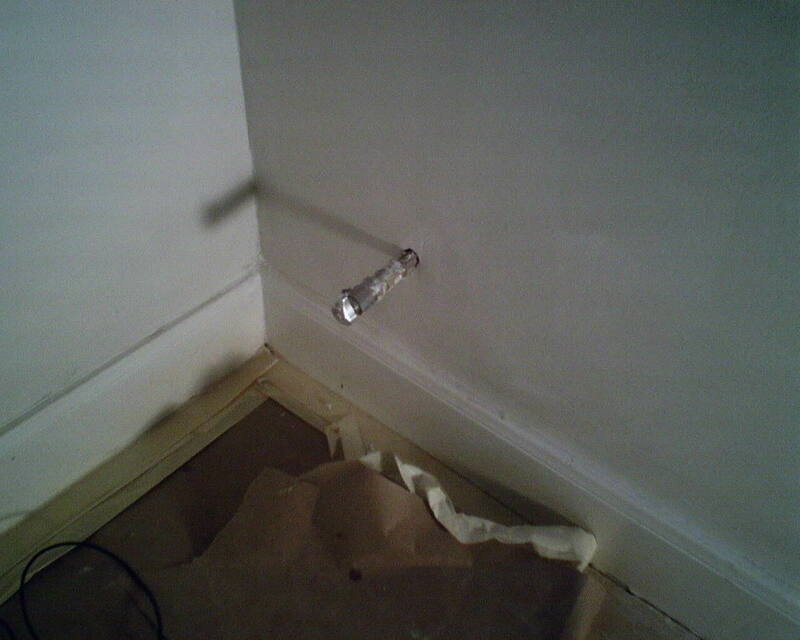 There is enough paste left on the wallpaper to hold it against the wall, once I smooth it into place. No need to wipe paste off the ceiling, no worries about paste residue staining the ceiling or causing the paint to crackle, no worries about getting water or paste residue on the face of the wallpaper. This waxed paper technique can be used in other applications when hanging wallpaper – but those are tricks for another post! This dark plum-colored wallpaper is printed on a thick and spongy, white non-woven material substrate. It’s quite likely that a white line will manifest at the seams, because that white backing just wants to peep out. Some manufacturers prevent this by printing their dark colorways on a black substrate – but I was not so lucky today. If the white edges of the paper can be colored to match the surface, it greatly reduces the chance of the seams showing. So I made a quick run to Texas Art Supply, and picked up three different “cures” for this problem: a permanent marker, a colored pencil, and a pastel (chalk) crayon. 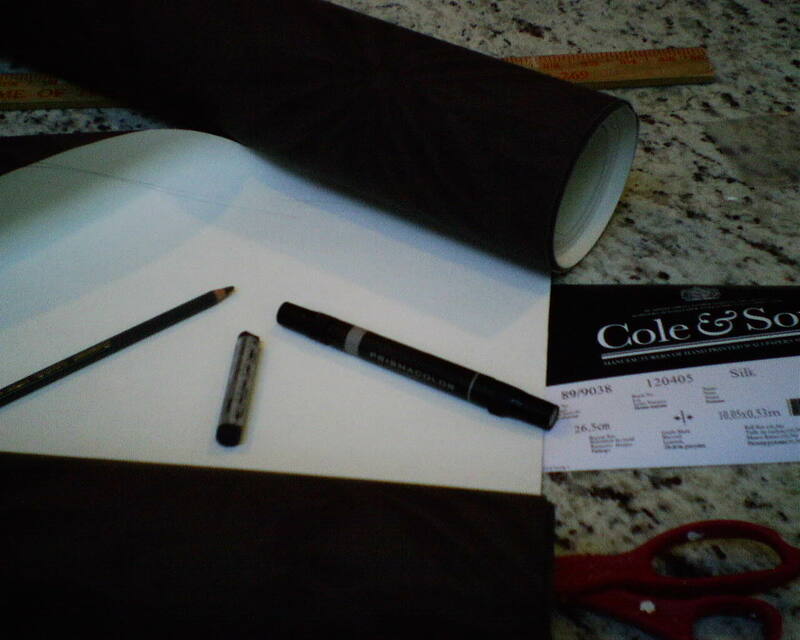 It’s important that these coloring devices be applied from the back of the wallpaper strip, to prevent color from seeping onto the surface of the paper, which would result in a dark line along the edge of each seam, which can be as bad as seeing a white line. The permanent marker, which usually works nicely on paper-backed vinyl papers, did not work on the non-woven material, because it bled a little onto the surface. I thought the seam looked bad, and tore the strip off the wall. Now the stress is on, because you only have so many strips that can be wasted, until you run short of paper to finish the room. I continued to experiment. The colored pencil, which adequately colored the edges of my test sample while I was at the art supply store, once I got back to the job site, failed to add enough color to the edges of my full-length strips of wallpaper. 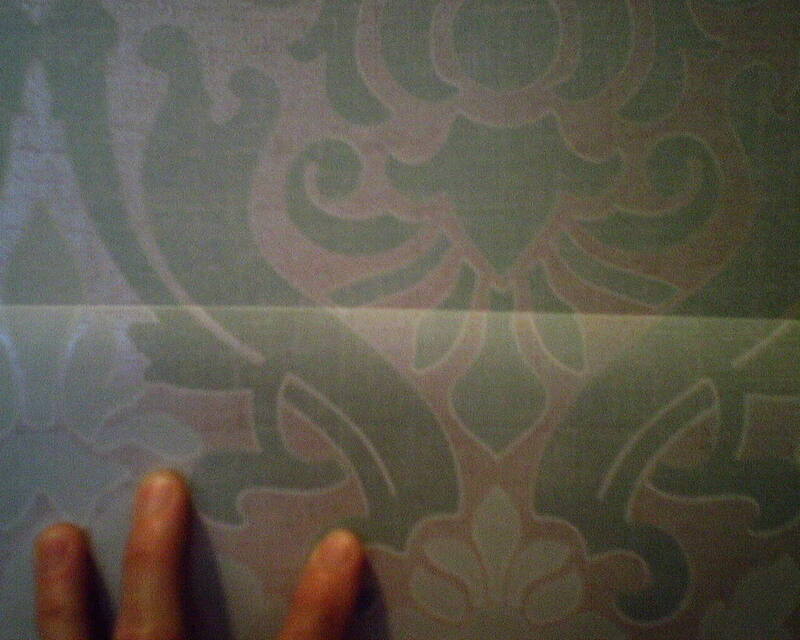 But the pastel did a nice job of covering up the white line, while not getting color onto the surface of the wallpaper. To make sure, I wiped the surface with my dry hand, to remove any residual pastel dust. Of course, all this would have been unnecessary, if the company had only printed their dark pattern on a dark backing! 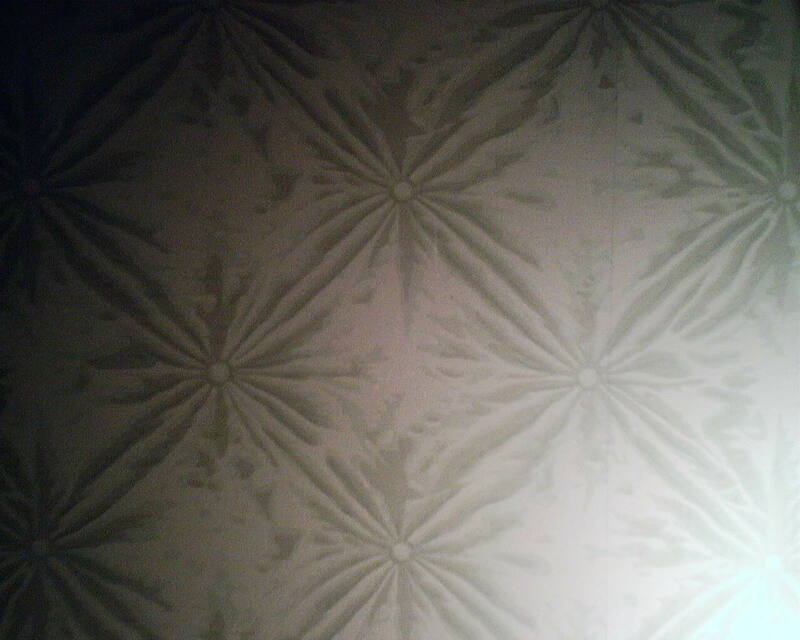 This wallpaper pattern looks a little like tufted fabric. The homeowner said it reminds her of pillows. This wallpaper pattern is printed on a non-woven backing, and is by Cole & Son, a British company, and was bought at a discounted price from Dorota Hartwig at Southwestern Paint on Bissonnet near Kirby. (713) 520-6262 or dorotasouthwestern@hotmail.com. Discuss your project and make an appointment before heading over to see her. 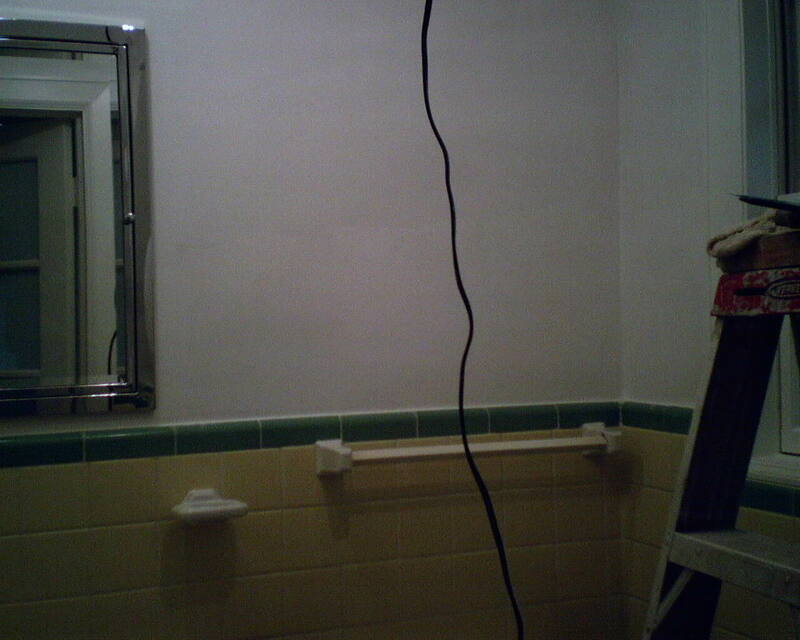 My Favorite Kind of Bathroom to Work In – EMPTY! 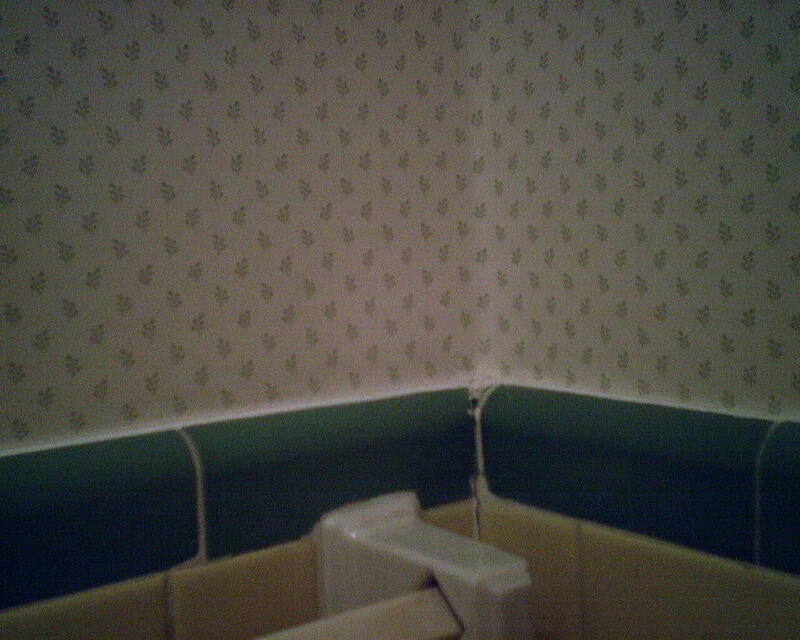 No vanity and no pedestal sink to cut around (and worry about the wallpaper tearing at stress points), and no toilet to jockey the wallpaper behind. Just plain, empty, flat, smooth, easy-to-access walls. Yum! To explain the photos, you are looking at my prepped-and-primed walls, and at the plumbing connections where the sink and toilet will later be installed. 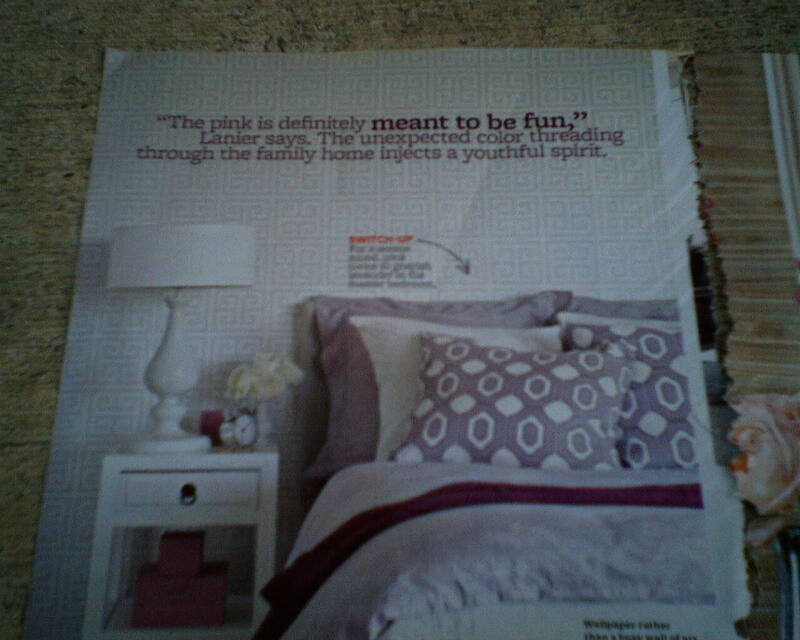 In two separate articles in the January 2014 issue of Better Homes & Gardens magazine, wallpaper was featured. In the bedroom shot, the story was about bringing a serene look to a home. This pale tone-on-tone pattern adds interest, while bringing a calming feel. Interestingly, I hung a paper very similar to this just yesterday. In the second photo, grasscloth was used as a backdrop for a display of floral arrangements. The guest bathroom in this early 1950’s ranch-style house near Highland Village in Houston still has its original yellow wall tile, with the funky green accent tile around the top. I love this old retro stuff, and so does the homeowner. She wanted a wallpaper that would work with the tile, but still look up-to-date. 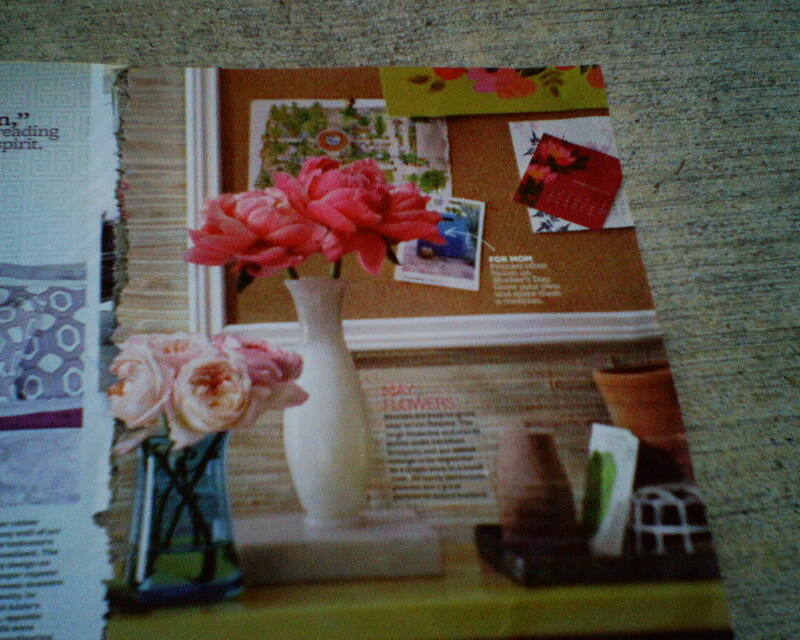 She had found a paper with square dots in a color that worked well with the tile. But it was one of the uncoated (stains easily) pulp papers by a British company (pricey). Dorota (read below) was able to find her some better-suited options, and she settled on this one. She asked my opinion before buying, and I said YES! It’s vinyl-coated so it’s a little washable, it’s less expensive, and I like the lively foliage pattern much better than plain old rectangular dots all over the paper. The first photo is the room after I’ve smoothed and primed the walls. The second photo is a finished shot, and the third is an (admittedly grainy) close up of the pattern. Click to enlarge and see a better view. 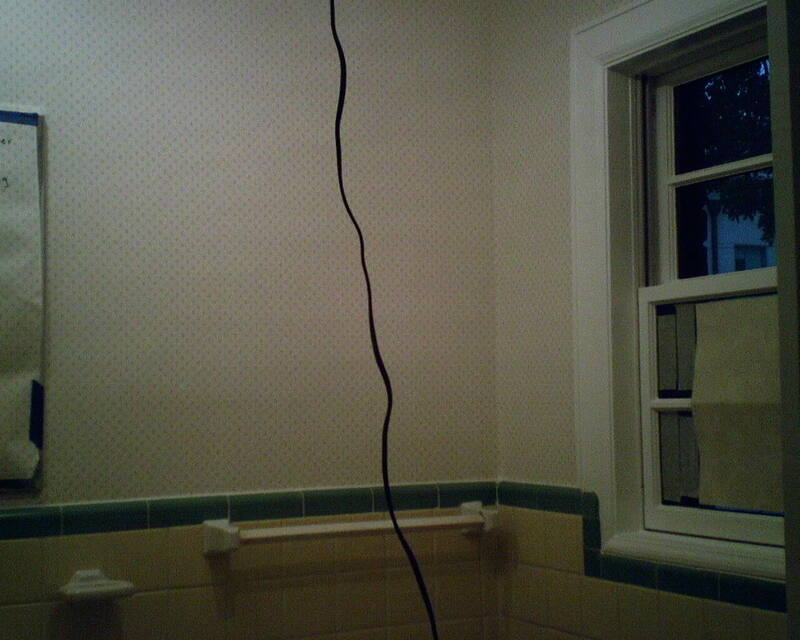 The black line is an extension cord going to supplemental lighting I rigged in the room. The homeowner was out of town while I did the work today, and will come home to a very happy surprise in her soon-to-be-children’s bathroom. 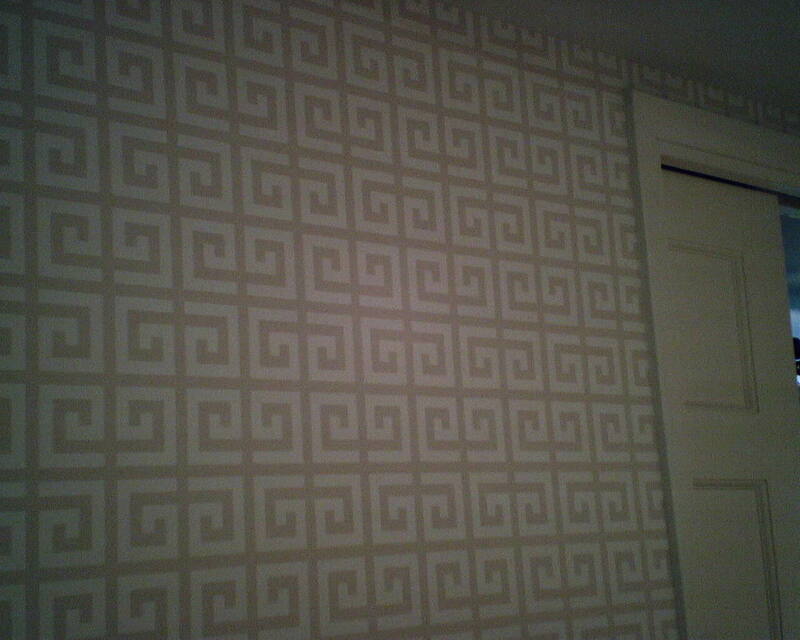 This wallpaper pattern is by WallQuest, and was bought at a discounted price from Dorota Hartwig at Southwestern Paint on Bissonnet near Kirby. (713) 520-6262 or dorotasouthwestern@hotmail.com. Discuss your project and make an appointment before heading over to see her. 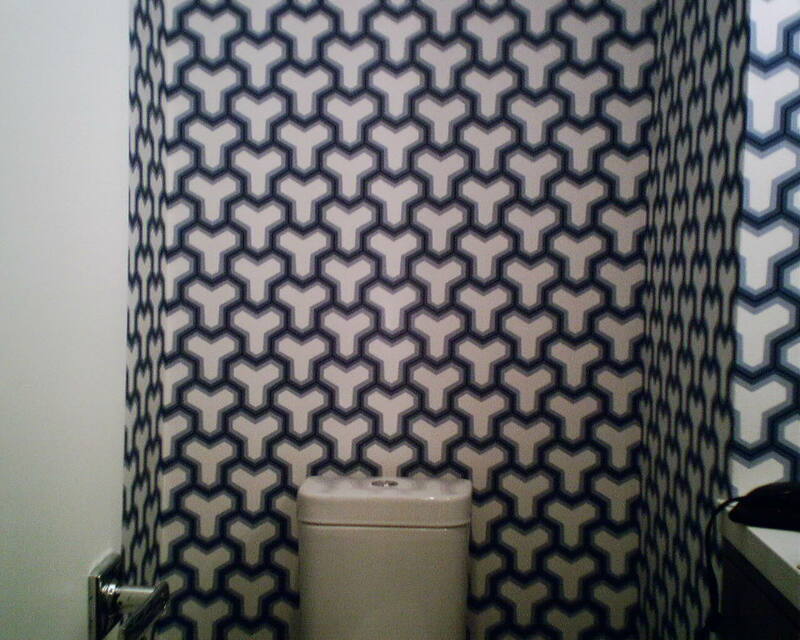 These homeowners originally wanted a wallpaper with a similar pattern and color, by Jonathan Adler. But that designer’s name added a hefty price tag. Plus, his paper has to be hand-trimmed, which takes more time and expense to install. So I hooked them up with my favorite wallpaper sales gal (below), and she quickly helped them find a very similar pattern that was much more affordably priced. 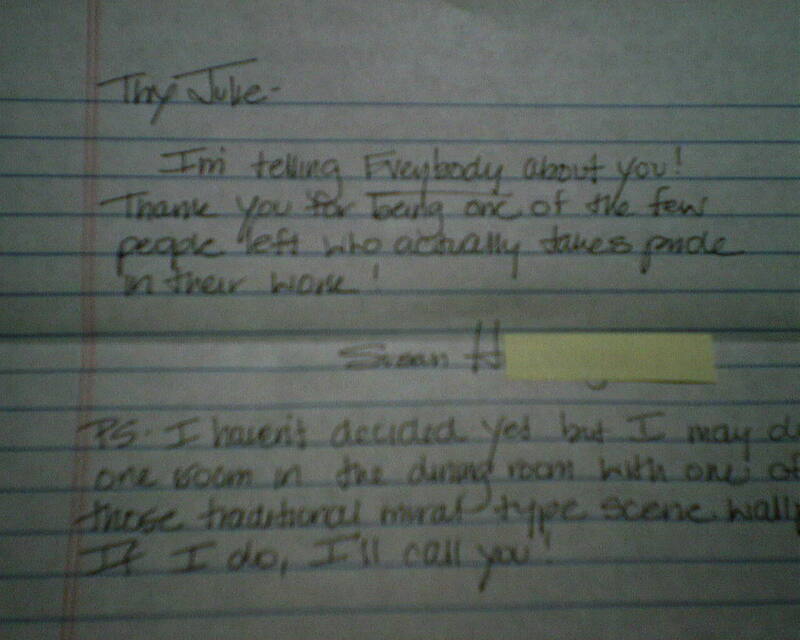 Needless to say, everyone was very pleased, with the price, the service, and the finished room. I hung this in a master bathroom in Hunters Creek Village, in Houston. This pattern is by Designer Wallpaper, #LA32805, and was bought at a discounted price from Dorota Hartwig at Southwestern Paint on Bissonnet near Kirby. (713) 520-6262 or dorotasouthwestern@hotmail.com. Discuss your project and make an appointment before heading over to see her. You are currently browsing the Wallpaperlady's Blog blog archives for September, 2014.